Mysuru: BJP leader and Mysuru-Kodagu MP Pratap Simha came down heavily on noted actor Prakash Rai (Prakash Raj) for questioning Prime Minister Narendra Modi for not reacting to the murder of journalist and activist Gauri Lankesh who was killed in front of her house on Sept. 5. “If Prakash Rai speaks against PM Modi, we will be forced to counter it using his own (Prakash Rai’s) language,” the MP said yesterday speaking to reporters at an event held to accord send-off for Dasara elephants. Double standards on issues of political murders. Two personal names as an actor: One to please Tamilians, another Kannadigas. No opinion on Cauvery water dispute for fear of displeasing Tamil audience of his films. It may be mentioned here that Prakash Rai, speaking at the 11th State meet of Democratic Youth Federation of India (DYFI) held in Bengaluru on Oct. 1, had criticised Modi for his silence over the murder of Gauri Lankesh. “Gauri’s killers have not been caught yet. But what is more disappointing is that people are celebrating her murder over social media, spreading hatred. Some of these people who celebrated her murder are followers of our Prime Minister on Twitter. We have a PM who shuts his eyes to this,” Rai had said. Taking umbrage at the actor’s statement, MP Pratap Simha asked Prakash Rai if he celebrated the death of 12 BJP workers. “Why did you not speak out then? Why didn’t you question Karnataka Chief Minister on the law and order situation in Karnataka and that too when it is a State subject,” he questioned. “Act like a villain in cinemas. Unfortunately, you have been a villain in real life too. Don’t change your views as you change your names,” MP Pratap Simha advised actor Prakash Rai. Ignore Prakash Rai! He is just an opportunistic greedy scumbag with a foul mouth! Wonder if he lost a lot of money due to demonitization! Or is it, the state funeral with 21 gun solute for Gauri Lankesh motivated him to take this no risk gamble! He is a good actor as a villain! But proving, he is a better villain in real life than on the screen! I dont understand his support for communist party or Naxalites! And simultaneously being rich! No one lost money due to a foolish decision like demonetization, it just ruined the life of normal people and huge job loss for in formal workers. 99% of cash which was in operation is in banks now, and paying interest for that. where is Jan lok pal ?? why not on board even after close to 4 years ?? Next CM candidate Mr.Yeddy, only with 22 corruption cases, even faced jail,,,, Clean or pretend to be clean ?? People who talk ill about demonetization should think what would have happened if it was not done. Terrorists, drug peddlers and fake money printers/ disributors from Pakistan/ Bangladesh will get strength to do it with even more impunity. Demonisation was meant to put a break for such activities. It may not be permanent solution, atleast it gave a big blow to their operations. And these guys, have lost their money big time. As long as black money hoarders are concerned, demo made their hoarded money useless straightway. However the money stored in foriegn countries remained “as is”, it can only be brought back through different means. As for as hurdles to common man, I have not seen anyone complaining on streets. Only those who kept hoarding illegal money, complanied. In fact Demo was meant to teach them a bitter lesson. So it served its purpose. 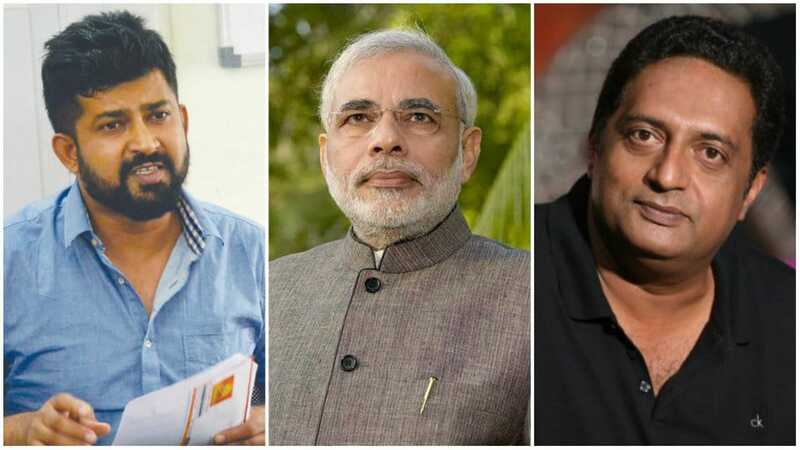 Mr.Pratap Simha’s criticism actor Prakash Rai is justified.Mr.Rai who was silent when many BJP RSS and JD (S) workers were hacked to death in Karnataka.Now making a big noise over Ms.Gauri Lankesh he is targeting Prime Minister Modi instead of taking to task the Government which is unable to trace the killers if Prof.Kalburgi even after two years and is also in the dark over Ms.Gauri Lankesh murder.Ironically he has also drawn flak not only over his silence on Karnataka’s stand over Cauvery issue and but also for symbolically taking part in the Tamil Nadu farmers’ protests for share of River waters in New Delhi. since he is of controversial nature person and is like a terrorist it is not advaisable for him to use his awards in future. let all those awards given to him be withdrawn or cancelled by the governamement. Only GOD can open the eyes of peoples who argue and try to turn their blind on real issues!! !